A knife is a pretty standard instrument: a pointed tip, a sharp edge, and a handle. Often symmetrical, occasionally curved, and sometimes both or neither, a knife is a generally straightforward object… except for knives from Africa. Knives from Africa don’t resemble knives from anywhere else on the planet, or from any other period in time. Whether used for throwing, farming, stabbing, chopping, sparring, bartering, celebrating, or simply for projecting prestige, each style is special and often beautiful, if not astounding. The design of African weapons has appealed to Western tastes for generations. As a result, these objects have had a marketable value for quite some time. 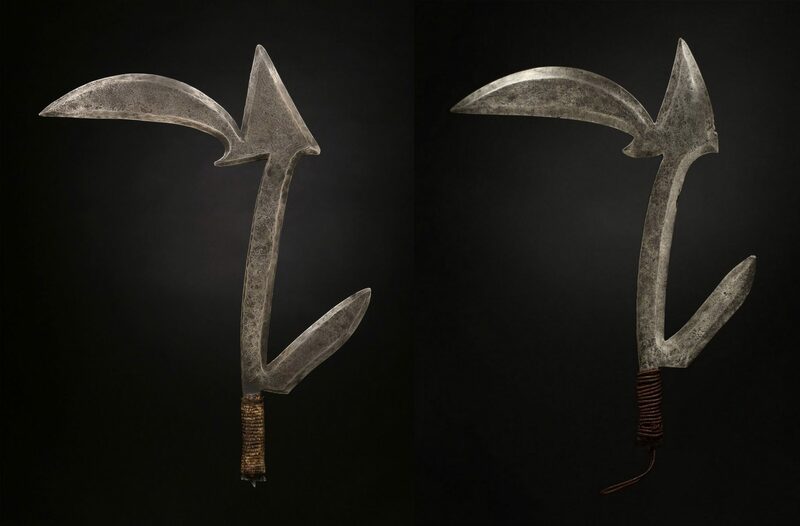 The Mangbetu and Songye were among the first ethnic groups to recognise European interest, and manufactured knives for sale to foreigners as early as a century ago. Groups like the Ngombe and Ekonda changed their traditional knife designs and even invented new styles to satisfy Western demand. 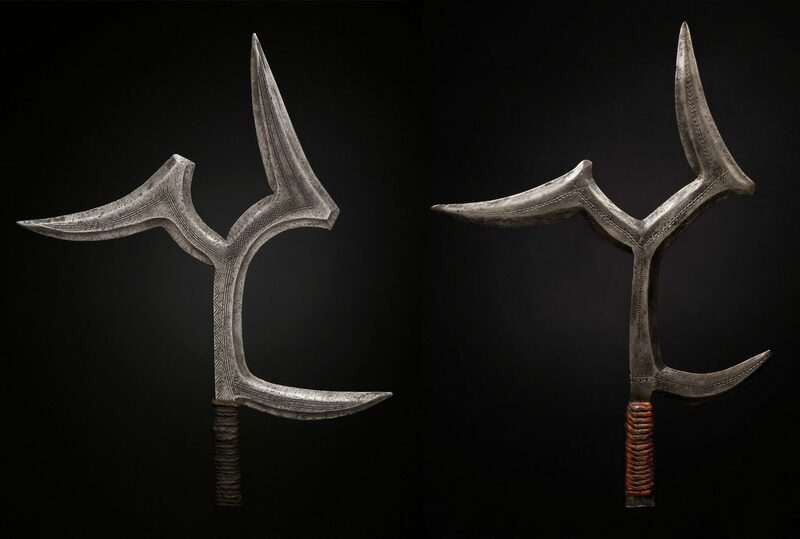 Today, the production of traditional weapons has all but ceased, and the available supply of collectible quality, original material is shrinking. At the same time, the market has refined its tastes and values, and collectors are consistent in what they deem special. Under these circumstances, the manufacture of reproduction weapons has increased, allowing sellers to continue to meet market demands. In my experience, the identification of reproduction weapons isn’t a great challenge for African weapons specialists, but outside of that niche group, very little information has been disseminated about how to identify reproduction weapons, even to general African art experts. To compound this problem, there are a number of African weapons specialists who have been involved in the unscrupulous process of using their expertise to manufacture extremely convincing reproductions. Over the last year, I have been actively purchasing inauthentic African weapons so that I can publish them on my website and write about the ways in which their manufacture proves their inauthenticity. My hope is that my efforts will help to inform buyers and sellers about the myriad types of reproductions on the market. I am aware that my efforts could—as a colleague warned me—“make the fakers better at what they do”, however I feel the truth is more important in this case than the unintended consequences. "Inauthenticity is an object manufactured or altered with the intent to deceive." Two knives that are entirely correct and made in Africa, but only 10 percent of their correct size (likely copied from a photograph). Additional examples of inauthentic material will be added, including some that are more challenging to wedge into my unavoidably simplistic criterion. For example, I recently acquired a Luba short sword in-sheath which was manufactured correctly in almost every way, but is clearly not only recent, but brand-new. This knife only became inauthentic when the seller described it as an antique. However with no demand for this weapon type (other than for sale), it can still loosely be described as manufactured with the intent to deceive. As I dig deeper into this endeavor, I expect more nuanced examples like this to emerge. 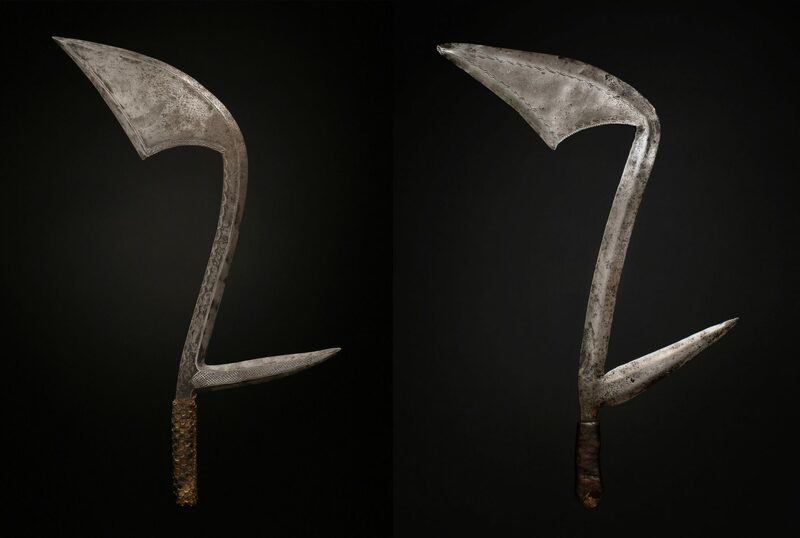 Exposing inauthentic African knives for what they are and delineating in detail the ways in which they reveal their true nature, is important to the antique, traditional African weapons market. Buyers should not be tentative about acquiring a knife because they’ve heard rumblings about all of the fakes, nor should buyers acquire an object only to discover it is disingenuous when information that could have protected them was available. My goal is to continue to work with buyers, sellers, and independently to share information about reproduction weapons, so that we can all appreciate the genuine ones even more. My collection of images and essays on inauthentic objects is located here. ÌMỌ̀ DÁRA contributor, Ethan Rider has been engaged in the business of researching, appraising, selling, and photographing African tribal art since 2004. His primary areas of focus have been the weapons of sub-Saharan Africa, the material culture of the Tiv of Nigeria, and the ancient terracotta burial objects of West Africa. He lectures and exhibits tribal art and photography at major art shows. In 2018, he published Something Magical: The Kwagh-hir of the Tiv, which will become the preeminent book on this vastly understudied masquerade.